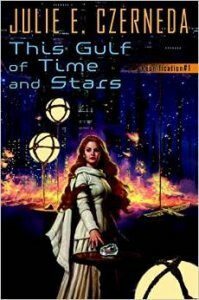 Julie E. Czerneda, This Gulf of Time and the Stars (DAW 978-0-7564-0869-5, $25.95, 453pp, hc) November 2015. Cover by Matt Stawicki. Someone is hunting the M’hiray, the people who can teleport themselves through the M’hir. Whoever this someone is, they have influence and money to send killers after many all at once. Sira di Sarc and her human telepath Chosen, Jason Morgan, try to save as many of the M’hiray as they can, and find themselves on the planet Cersi, from which the M’hiray came. Particularly for those who’ve been following this series, it’s interesting to see what happened to the three sentient species sharing the planet, and learn new secrets about their past. The conclu­sion leaves an awful lot hanging – like who is after all the M’hiray, or what exactly the end of a mysterious experiment will mean – but it’s all intriguing. 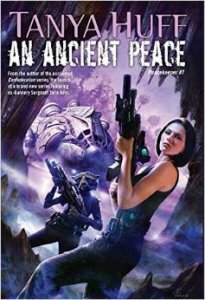 Tanya Huff, An Ancient Peace (DAW $24.95, 328pp, hc) October 2015. Cover by Paul Youll. Ex-gunnery sergeant Torin Kerr from the Confederation series is back, if no longer in the Marines. Instead, in this first volume in the Peacekeepers series, she and a small crew are doing mercenary work for the Justice Depart­ment as ‘‘independent contractors.’’ Their latest mission is to find out where someone is finding relics of the H’san, one of the Elder Races, and selling them illegally. The fear is that highly advanced weapons might be among the grave goods from a ‘‘lost’’ cemetery planet, setting off a civil war between the Elder and Younger Races (including humans). There’s the usual banter among Torin’s crew, which includes three humans, one of the sexually indiscriminate di’Taykan, and a pair of Krai (who eat anything). There’s also plenty of action, as they track down the graverobbers through a massive maze full of lethal traps. Partly it’s a fun adventure, though the group finds some uncomfortable moments when they have to mingle with people of the Elder Races – a discomfort that suggests there’s more depths to plumb in that direction. Yanni Kuznia, A Fantasy Medley 3 (Subter­ranean Press, 978-1-59606-767-7, $20.00, 151pp, hc) December 2015. Cover by J.K. Drummond. 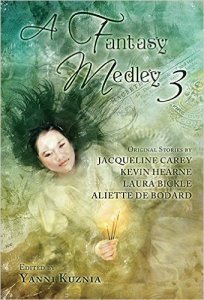 The third volume in this anthology series presents another four stories by fantasy authors. The only one in a series I’ve followed, Kevin Hearne’s ‘‘Goddess at the Crossroads’’ is part of the Iron Druid Chronicles, in which Atticus the druid tells his trainee Granuaile about his encounter with William Shakespeare, who’s eager to see some real witches for the play he’s writing. Atticus’ comments about excrement in the streets and the Globe theater’s lack of toilets are a memorable part of the story, but it’s all amusing. ‘‘Ashes’’ by Laura Bickle picks up the adventures of Detroit arson investigator and spirit medium Anya Kalinczyk, who runs into the real Nain Rouge – a supernatural red dwarf who sets fires – during the festival in his name. With Sparky the giant salamander familiar and the psychopomp Charon helping out, this turns into an entertaining chase. 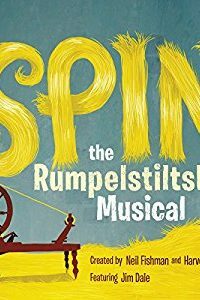 A lot of new discoveries are packed into the story, especially for someone unacquainted with the series, but fans of the two novels so far should enjoy the revelations. Aliette de Bodard’s ‘‘The Death of Aiguillon’’ is tricky to follow, set 60 years before her latest novel, The House of Shattered Wings; this follows the aftermath of the death of a House, following the now Houseless Huyen, formerly known as Heloise, as she tries to pick up the pieces of her life. Jacqueline Carey’s story ‘‘One Hundred Ablutions’’ tells a nicely understated tale of a special slave who must carry water for her masters so every day they can perform a ritual cleansing – a spirit-crushing job that comes with nice lodgings and respect – but miserably restricted lives. Overall, it’s an interesting sampler, if not an outstanding one.